The concept of molality arises while studying solutions. Molality is also called as molal concentration. A solution is formed when a solute is dissolved in a solvent. Solute is a substance which is dissolved in another substance during the formation of a solution. Solute are usually in smaller quantities. The solvent is a substance which dissolves solute in itself during the formation of the solution. The solvent is usually in larger quantities when compared to the solute. For example, salt is dissolved in water here salt is the solute and water is the solvent. Sugar dissolve in juice, here sugar is the solute and juice is the solvent. Hence when a solute dissolves in a solvent a solution is formed. The solutions in which the solute is evenly distributed throughout the solvent is called as a homogeneous solution. 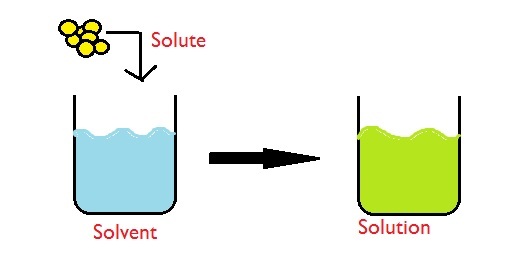 The amount of solute dissolved in the solvents, and the solution formed can all be expressed in terms of concentrations. There are different ways in which the concentration is estimated such as molarity, molality, formality, percent composition and many more. The amount of solute dissolved in one kilogram of the solvent is defined as the molality of the solution. The amount of solute is expressed in moles. Therefore the molal concentration of a solution is the moles of solute in kilogram of the solvent. Moles of the solute used to form a solution. Amount of the solvent expressed in kilograms. The molality of a solution is expressed as ‘m’. The units for expressing the molality equals moles/kilograms or mol/kg. Question: Find the molality of 5 moles of Nacl mixed in 2000 grams for the solvent? Here the moles of the solute = 5 moles. The amount of the solvent = 2000 grams. Expressing the solvent in Kilograms = 2000/1000 = 2Kg. Simplifying the calculation, Molality = 2.5 m.
Question: Find the number or moles of FeO dissolved in 1.5 kg of solvent, if the molality of the solution if 0.3m. Here, the amount of the solvent = 1.5 Kg. Molality of the solvent used = 0.3 m.
This gives Moles of solute = 0.3 x 1.5 = 4.5 moles of Feo. Question: Find the amount of the solvent if 0.24 moles of the solute is dissolved to obtain a molality of 0.48m? Here, the number of moles of the solute = 0.24. The molality of the solution = 0.48 m.
The amount of the solvent = 1/2Kg = 0.5 Kg. Question: Calculate the molality when 20 grams of KCl is dissolved in 400 gm of the solvent? Mass of solute = 20 grams. Moles of KCl = 20/74.6 = 0.27 moles. Amount of solvent in Kg = 400/1000 = 0.4 Kg. Question: What is the molality of the solution when 15 grams of Na2CO3 is dissolved in a 0.25 kg of solvent to form a solution? Given is the mass of Sodium Carbonate = 15 grams. The number of moles of Na2CO3 is required for finding the molality of the solution. The Molar mass of Sodium Carbonate Na2CO3 = 2 (Na) + C + 3 (O). Refer the periodic table for the atomic mass unit for Na, C and O.
Molarity and molality are both used to express the concentrations of a given solution. Molarity is the number of moles of solute dissolved in one liter of the solution. Molarity is also called as the molar concentration of the solution. Molarity of a substance gives the concentration with respect to the total solution whereas the molality gives the concentration with respect to the amount of solvent. The units for expressing molarity is mol/L or M.
Following are very unique and useful solved examples involving molality and molarity. Question: The molality of a solution formed by dissolving NaCl in a solvent is 0.56m. The density of the solution is 1.8g/ml. What is the molar concentration of the solution formed? The molality of the solution = 0.56m. This implies 0.56 moles of a solute NaCl is dissolved in 1 kg of the solvent. Density of the solution given = 1.8g/ml. Using the density formula . Volume of the solution = 1.8 x 1032.73 = 1858.91 ml = 1.85891 L = 1.86 L (approx.). Question: The molality of a solution formed by dissolving KI in a solvent is 1.2m. The density of the solution is 2.5 g/ml. What is the molar concentration of the solution formed? The molality of the solution = 1.2m. This implies 1.2 moles of a solute KI is dissolved in 1 kg of the solvent. Density of the solution given = 2.5g/ml. Volume of the solution = 2.5 x 1199.20 = 2998 ml = 2.998 L.